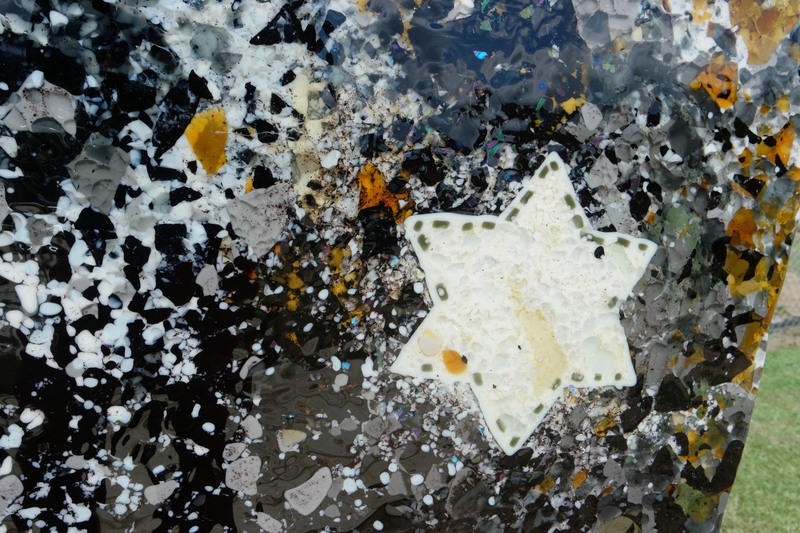 The Holocaust Memorial tells the compelling story through images in glass art. When I was asked to prepare a design for the Holocaust Memorial I gladly accepted knowing the challenges ahead for me and my studio team. All along the way members of the Beth Israel Congregation have been supportive by allowing us the freedom to express the ideas shown here. The images ground us in the key points of the Holocaust narrative. The abstract images allow each viewer the freedom to experience the Holocaust Memorial for themselves. The spiral walkway has a steel train track embedded into the concrete. The stained steel ties symbolize the millions of people packed into rail cars and delivered to concentration camps. The initial design sketch was inspired by earth, sky and the grayness of concrete. I knew that the subject was going to be more challenging than any I have faced before. The initial concept drawing was kept open and expressive to allow the designs of the sculptures to unfold as the project moved forward. I began by investigating ideas in sketch form in black and white. But first, in order to get a sense of the scale I made full size mock ups of the forms and colors on cardboard and mounted them in place. I needed to see what they looked like in the garden landscape. I wanted to be assured that I had the right size and number of pieces to make the needed impact on the viewer. It was only then that I prepared half size renderings of the sculptures. These renderings were the models studio glass artist Joy Kichi used to interpret and create the glass. When I started I had some ideas for the themes in my mind. I have always wanted to investigate Kristallnacht because of the broken glass. Further research revealed the themes for the disappearing village and book burning. Even now after the glass is in place I believe that the work is continuing to unfold. As the glass gains an audience the art work will take on a life of its own, beyond whatever I could have imagined at the beginning. This has been the most meaningful art creation that I have been apart of. I feel extremely lucky to have been able to participate in the vision and create this beautiful glass that honors and represents the spirit and legacy of the Jewish people during such a horrific time in history. I believe the memorial has many meanings; but one that I felt as I created the glass was a charge in my own life to be brave and be against oppression in any form. Many members of Pearl River Glass Studio, Inc. have contributed to the project. 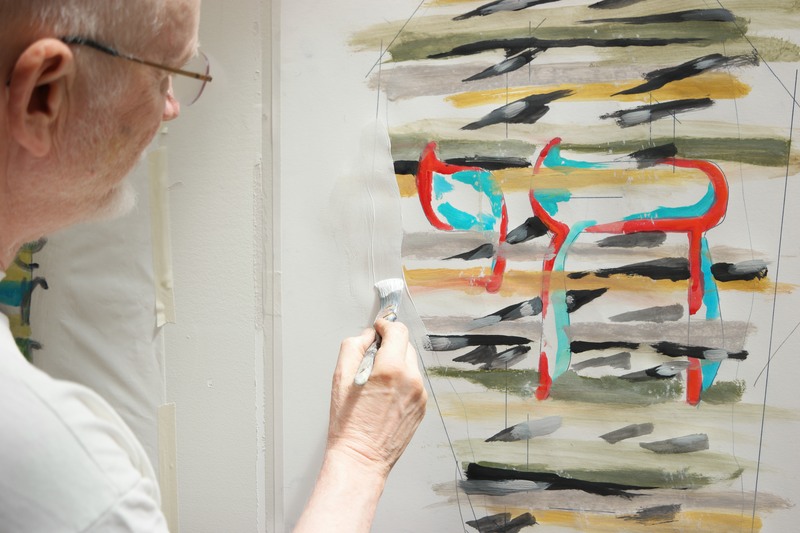 Andrew Cary Young developed the design concept and selection and painting of the individual themes. Joy Kichi glass artist and production manager created the images in glass. Tom Crouch our design manager worked through the myriad details of construction and technical glass cutting, Patrick Johnson oversaw much of the concrete and steel fabrication. Peter Hammond and the install crew developed and managed the installation including Bob Hudson, Mikail Jury and Kevin Harrington. From the beginning of the Holocaust Memorial project the intention was to provide a monumental display of glass art pieces. Soil engineers provided the data the structural engineers needed to design an underground concrete foundation robust enough to support the 800 lbs of art glass displayed on each column. Each of the fourteen pieces of glass is attached to a specially designed galvanized steel bracket with though bolts and special silicone adhesive. The actual installation of four men and a mechanical lift was about a day’s worth of work. It was the prior year of planning, engineering, forming, steel reinforcement, pouring and finishing of concrete grade beam and columns that allowed the installation to proceed without a hitch. All along the making of the Holocaust Memorial has been a team effort. Project Manager Bill Heimer oversaw all of the landscape construction with the help of Monty Montgomery and crew. From Pearl River Glass Studio, Tom Crouch, Design Manager worked through the myriad details encountered on the steep learning curve presented to the staff by this project. Austin Richardson cut and fabricated the steel railroad track, Patrick Johnson oversaw the steel and concrete foundation for the grade beam and columns, Joy Kichi created the glass forms, Shannon Valentine assisted in the painting of the initial cardboard mock ups and made one side for the Kristallnacht glass sculpture. Peter Hammond was the lead on the installation process with the able help of Bob Hudson, Mikael Jury, and Kevin Harrington. Dalton Thornton assisted with the water jet cutting process. Embedded in each glass sculpture is one digit of the tatooed serial number of Gilbert Metz, a beloved member of Beth Israel Synagogue and a survivor of the holocaust. His number was 184203. The star patch was one of the early steps in the process of ostracizing the Jewish people from the larger culture; before physically removing Jews from society to ghettos there were a series of restrictions on businesses, and personal freedom; such as the use of public transportation, playing of sports, sitting on park benches, the use of sidewalks, or owning of cars and even bicycles. The design is an abstraction of the architecture and environment of the ghetto. The rough brick texture is shown in tones of crushed brown glass. The design also has deep black slashes through it. In Auschwitz the camp and everything in it was painted black, grey, and white. The slashes of blue represent slivers of the sky. The artwork also alludes to the Burning Bush, when Moses was commanded to go and free his people from oppression. Disappearing Village is the spirit of these families are represented in the panel as blowing wind.